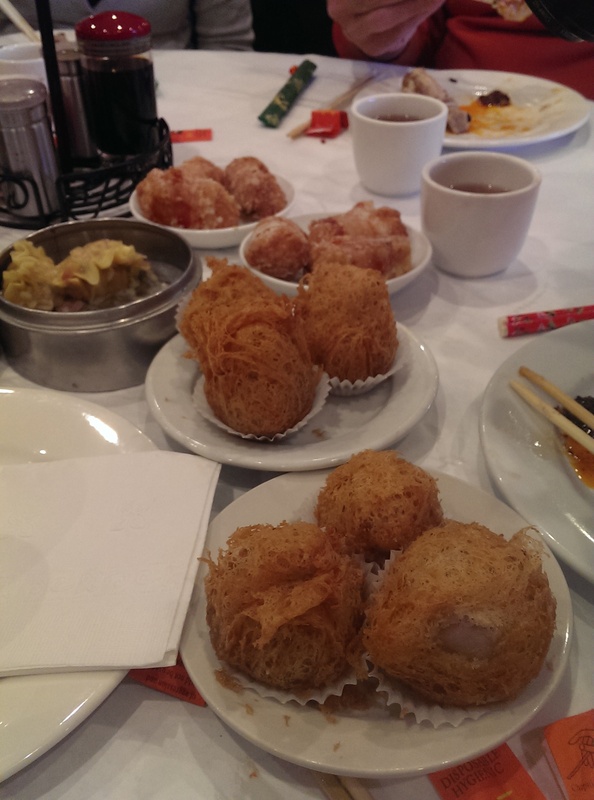 As most of my long-time readers know, one of my favorite meals is going out for dim sum with friends. 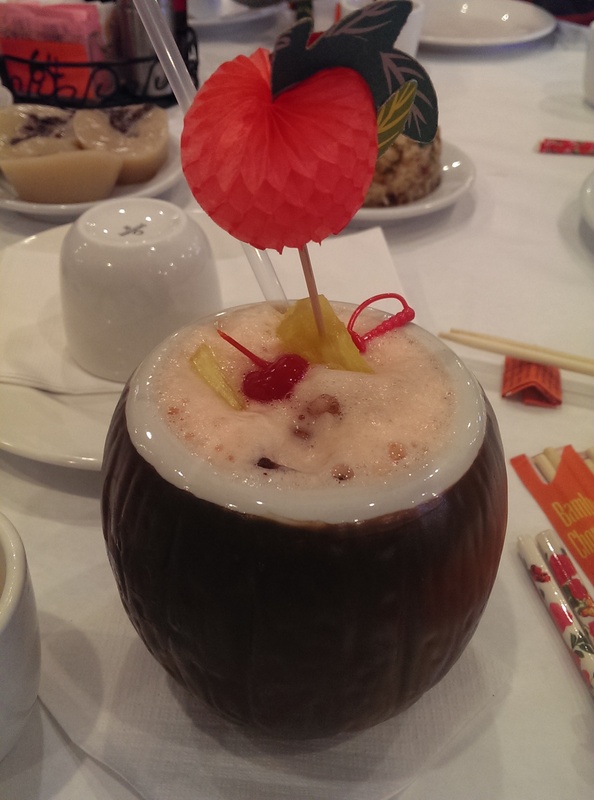 One of the most fun events of the year is celebrating the Chinese New Year at Li Wah. 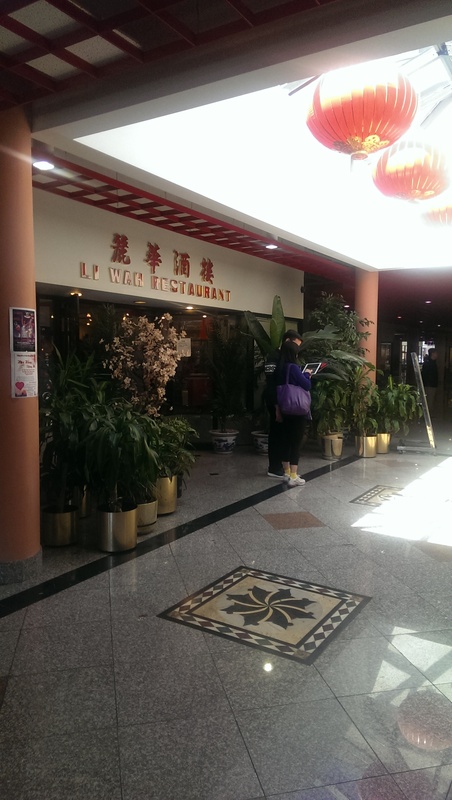 Li Wah is located in Asia Plaza on East 30th and Payne Avenue. I managed to score a parking space in the side lot, but there was plenty of parking available in the back of the plaza. When we left at 12:30 people were parking along Payne Avenue and the back lot was full. It’s a very popular event. 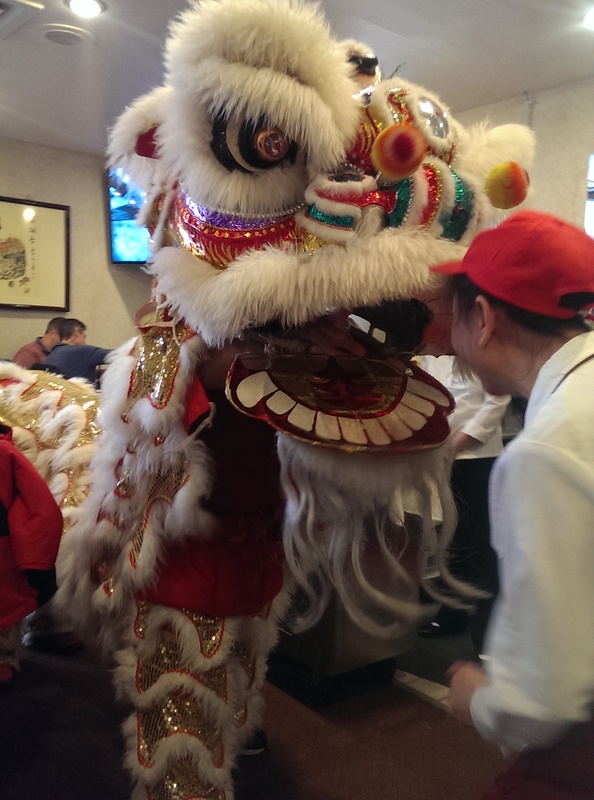 We met this past Saturday, braving the Arctic temperatures, for dim sum and to watch the Lion Dance. My friend Nancy from Fun Playing with Food put in a lot of work trying to herd all the cats together for this, with several dates and times suggested and schedules compared. 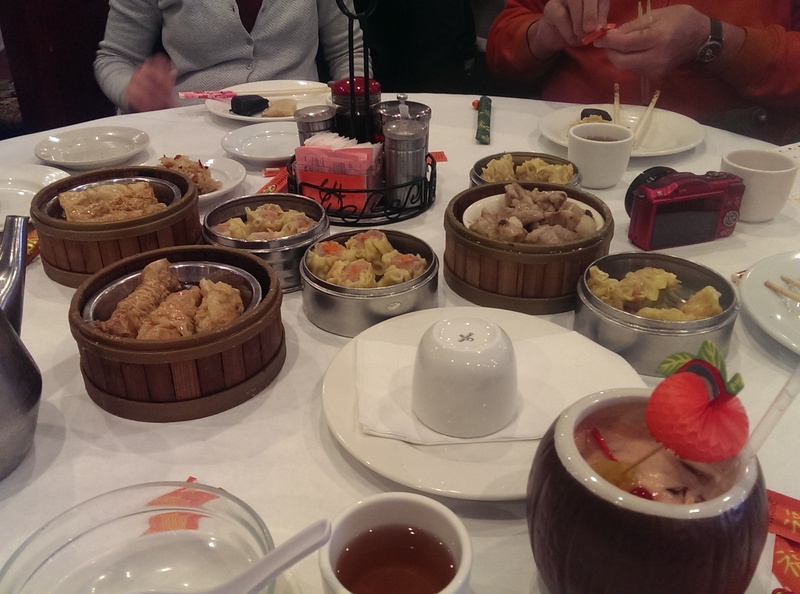 In the end, we were six people for dim sum, with three calling off at the last minute. Nancy and her husband got there right at 10 when they opened to get us a premium table. I tried to make it there as close to 10 as I could in solidarity, because there is nothing worse than being hungry and watching all the carts groaning with tasty treats go by as you wait for everyone to get there. They had a pot of tea waiting, and I had brought some fancy chopsticks for everyone to have instead of the wooden disposable ones. I started off with some wonton soup, which in hindsight I probably should not have had because it filled me up quickly. But I love it and enjoyed every last drop. The bowl was brimming with lots of tender wonton dumplings with a nice firm pork filling. I love the wonton dumplings here because they are full of goodness. 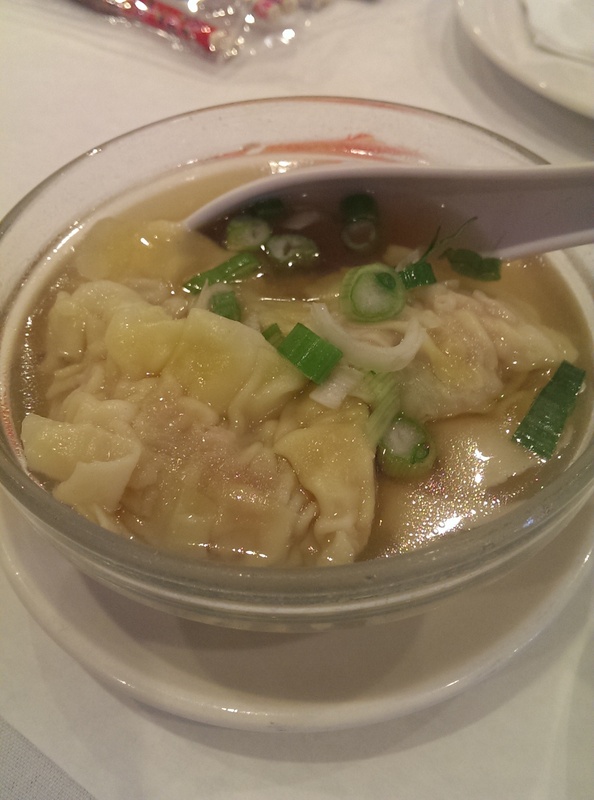 Other wonton soups have a lot of extra dumpling dough. These are obviously handmade too. The green onions and light hint of ginger in the broth warmed me up perfectly. I also ordered a Mai Tai, because come on it’s Saturday brunch. It definitely hit the spot. Not too cloyingly sweet, it was a very nice adult beverage. I loved the apple umbrella instead of the usual basic paper umbrella. I could feel the alcohol hit me about halfway through, so that was nice. I am not a big drinker, so one was perfect. The first round was chosen right before the rest of the group got there, but they arrived very shortly afterwards. 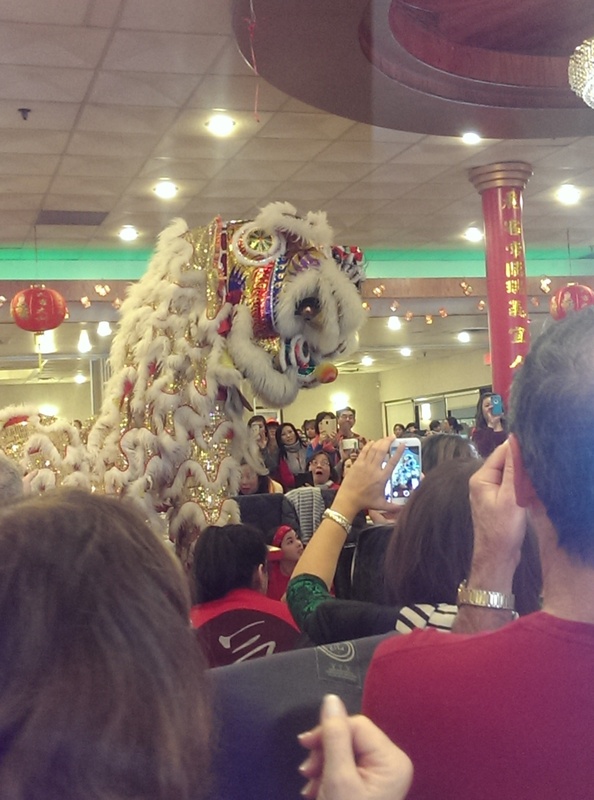 Nancy wanted to strike while she saw the special New Year’s dim sum offerings. 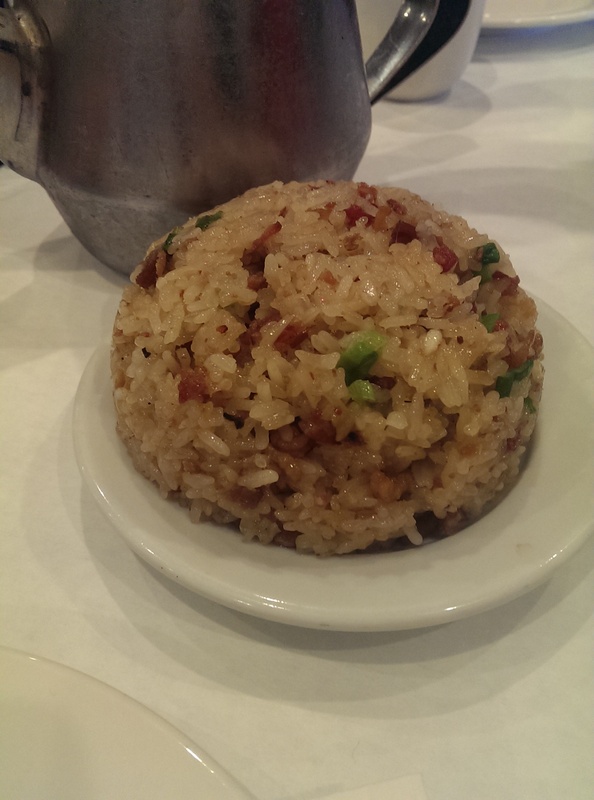 She also ordered a sticky rice, because they are very popular at Li Wah and tend to run out quickly. The first round was more sweet than savory. Red bean paste coins and black sesame seed rolls were definitely unique choices that will hopefully bring us luck in the coming year. The red bean paste was a creamy consistency and the whole beans were soft enough that they did not detract from the creaminess of the paste. The black sesame rolls were definitely different. They had a toothsome quality, yet Nancy’s husband equated the consistency as eating jell-o with chopsticks. They appeared to be a flat dough that was rolled out thinly and then rolled into a kind of elongated shape. I don’t know if I would order them again, but they were a fun little treat. The sticky rice was as delicious as usual. Nice and savory with some shrimp flakes added to it. I love their sticky rice there. Things started getting more intense with the next round. Nancy just kept on ordering for us – lots of favorites, including tofu skin rolls (pork and mushroom filling wrapped in a yuba bean curd wrapper), shu mei (steamed pork and shrimp dumplings), spare ribs with black bean sauce and some other kind of dumpling that kind of looked like their shark dumplings (made with pork and shrimp – not shark). This was definitely my favorite round because I love tofu skin rolls and shu mei. One per person was just enough and we had a couple dumplings from the four piece plates that ended up sitting around to the end. There was simply so much goodness to enjoy we didn’t want to fill up too much. Another round brought deep fried goodness in the form of deep fried taro and the most amazing dim sum I have ever tasted – a seafood paste wrapped in bacon and deep fried. The deep fried taro dumplings feature taro paste that has been mixed with mushrooms, pork, and shrimp, rolled in a breading and then deep fried until feather light and crispy. As for the bacon-wrapped seafood, the bacon and seafood flavors really melded together well and made for a delightful couple of bites that I savored. 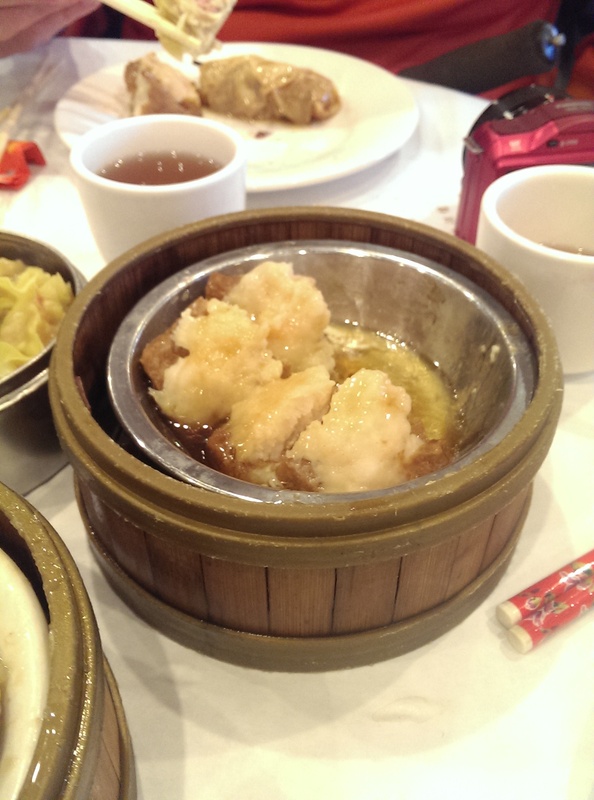 I hope I can find it again on regular dim sum days. 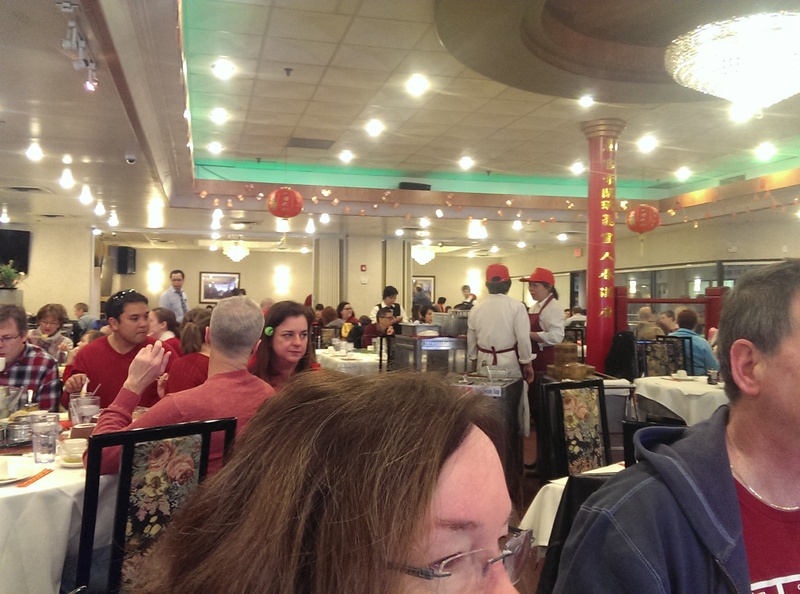 By 11, which was the scheduled start time for the Kwan Lion Dance, the restaurant was really filling up. They were setting up large round folding tables in the hallway to accommodate the crowds, and there were lots of carts circulating all around the restaurant. It was just a really fun atmosphere. I forgot to keep photographing, so my photos of the food from here on are non-existent. By that point I had hit the wall of fullness (thanks, wonton soup), but a couple other notable bites were the shrimp stuffed tofu and the deep fried eggplant stuffed with pork and shrimp, which is one of Nancy’s all-time favorites. We ordered some green vegetables for some roughage – the Chinese broccoli with oyster sauce. I liked the flavor a lot, but it was a little overcooked. I didn’t mind it being a little softer, but some people prefer it to be much crisper than it was. I think it had been on the cart for a while. It still hit the spot as a veggie in a dumpling-heavy meal. On yet another round Nancy grabbed orders of steamed taro cakes and turnip cakes, which the server graciously divided in half for our table to share, as well as potstickers. 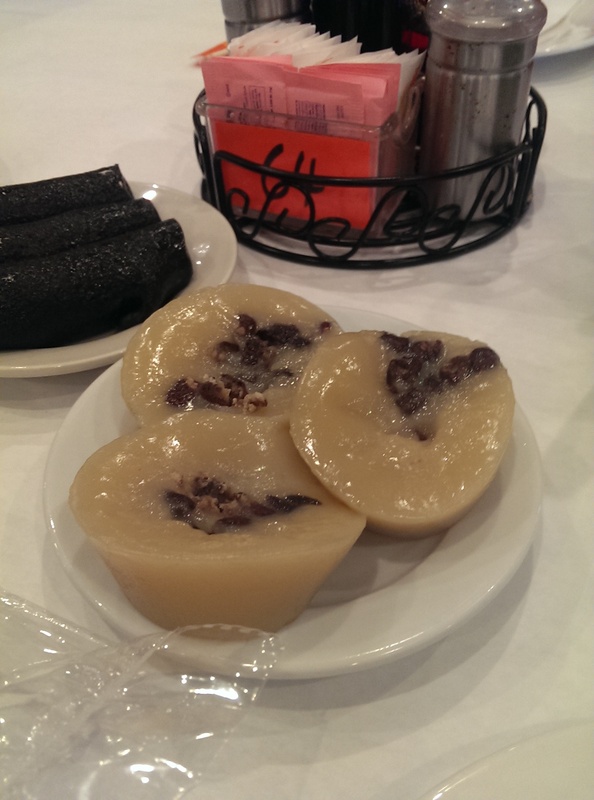 The taro cakes were slightly overcooked and fell apart rather easily. The turnip cakes were good. They are a little creamier than the ones at Emperor’s Palace, which are my absolute favorites. I can’t say anything about the potstickers. I don’t think I ate one because I was just full. Nancy ordered two Beijing duck steam rolls when they came around at the very end, because she really wanted some roasted pork or duck from the hanging cart. At that point we were so full that the two couples enjoyed splitting the steam rolls, I watched them enjoy them, and the sixth member of our table got a nibble of the duck meat. I don’t think we could have handled a huge plate of roasted meat, although their roasted meats are delicious. We had started winding down on the food feast when the Lion Dance started. 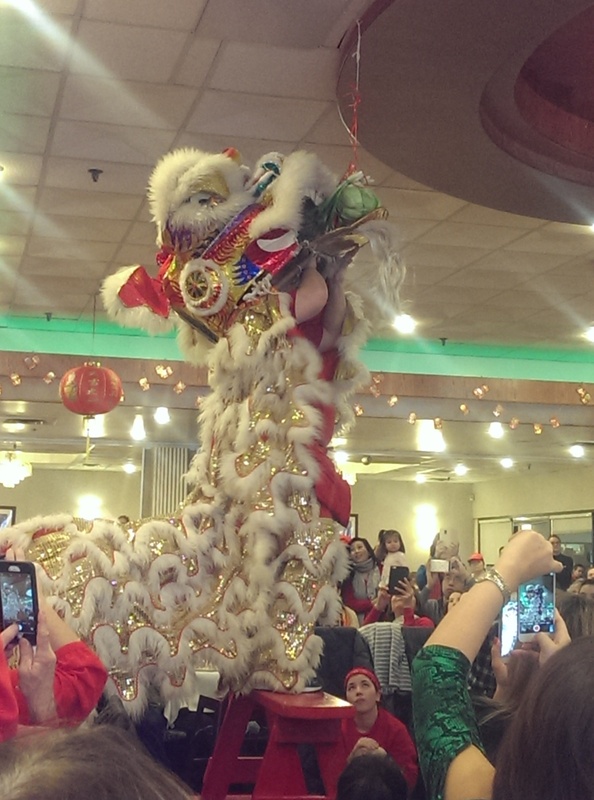 The Kwan family has been busy this season performing their Lion Dance all over Cleveland. It starts off with firecrackers to scare away the bad spirits and then the Lion dances around the restaurant to the rhythmic beats of the drums. People put money in envelopes for good luck (any amount except increments of four, which Nancy informed us was bad luck) and feed it to the lion as it meanders through the room. 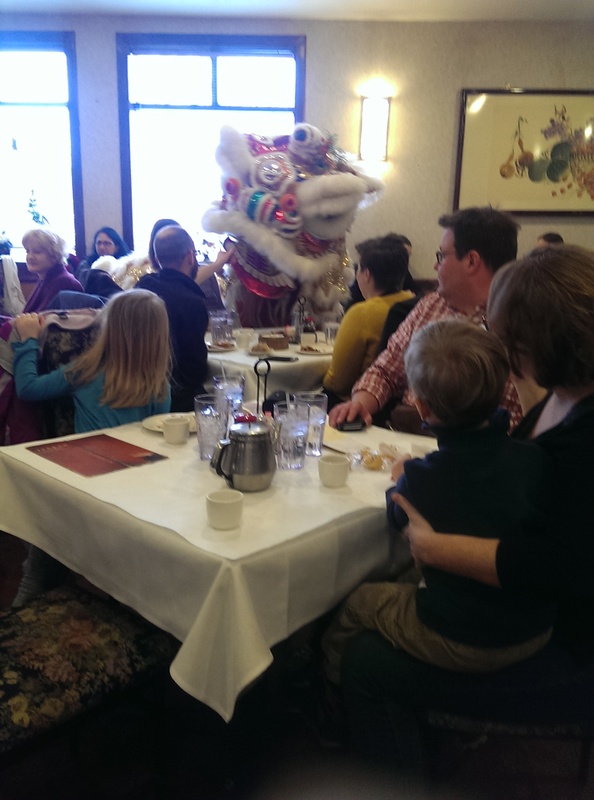 I love watching the little kids’ reactions to the lion, but this photo of a cart server feeding an envelope to the lion is my favorite photo from this particular performance. The joy on her face and the playful stance of the lion make it a fun photo. Once the lion has made its way through the room it ends the performance by climbing up on some benches and pulling down a head of lettuce (and this year it was also dressed with some green onions). The lion then shreds the lettuce and “spits it out” and kicks it at the audience. I love the photo with its head bowed, because the look on the woman’s face in the middle of the photo is priceless. It’s a fun way to spend a Saturday morning. We paid our check (with me deducting my Mai Tai before calculating the per person cost) and divided it up for a grand total of just under $20 a person. They kind of threw me, because they automatically added gratuity this time, which they normally don’t do, so the originally quoted $23 a person dropped down to $19 and change. I added the price of my Mai Tai, gave them the pile of money, and we headed out into the frigid air to go about the rest of my day. I will most likely be full until around 6 or 7 and will have a bowl of cereal for dinner. Not a bad day enjoying some delicious “heart’s treasures” with friends and fellow food lovers. Nancy has documented the individual dishes on her Flickr feed. The photos are beautiful, so be sure to check them out. Note: their website is pretty atrocious, so I am linking to their Facebook page in the Contact Info below. Also, be sure to check out the photos on Yelp to really get your taste buds revved up. Just point at stuff on the cart and enjoy.